Second, there are concerns the law runs afoul of European Union agreements. According to the Irish Times, the Irish ambassador assured Netanyahu the elected government would not implement the law. She warned the law "would put Ireland in breach of EU law and expose Dublin to legal action by the European Commission." Irish Foreign Minister Simon Coveney also warned that the bill is "not legally sound." Third, the law would seriously jeopardize Ireland's business and diplomatic relationship with the United States. Federal law currently prohibits American companies from participating in overseas boycotts. Major companies, including Apple, Facebook, and Google have business in Ireland, and would likely be affected by the law. Given the choice between business in the U.S. and business in Ireland, these companies would likely leave Ireland in the lurch. The American Chamber of Commerce Ireland warned that the law could raise new problems. "We believe that the provisions in relation to its trade and investment implications require further examination, particularly in the context of the recently announced US-EU Trade Agreement negotiations," it said Thursday. Finally, the law might actually hurt the Palestinians the measure intends to support. Israeli officials have warned the law would harm the thousands of Palestinians working in the West Bank, which Ireland does not recognize as rightfully Israeli. The Irish Times reports the Irish government agrees: should the bill become law, "the Government is also concerned that it will have less influence in the region and lose its ability to help the Palestinians." The United States, with its strong support for Israel, is moving opposite the Irish parliament. The Senate is currently considering a bill to support Israeli opposition to international boycotts. Sen. Marco Rubio (R., Fla.) introduced S.1, originally titled "A bill to make improvements to certain defense and security assistance provisions and to authorize the appropriation of funds to Israel, to reauthorize the United States-Jordan Defense Cooperation Act of 2015, and to halt the wholesale slaughter of the Syrian people, and for other purposes." 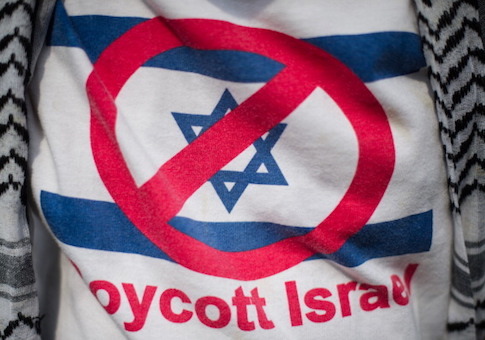 The bill proposes to strengthen American support for Israel in defiance of BDS and other anti-Israel efforts by prohibiting federal contracting with organizations that refuse to work with Israel. This entry was posted in Politics and tagged BDS, European Union, Israel. Bookmark the permalink.